A de Havilland Canada DHC-8-402 Q400 passenger plane sustained substantial damage in a landing accident at Copenhagen (CPH), Denmark. SAS Flight 2867 departed Bergen (BGO), Norway on a flight to Copenhagen (CPH), Denmark. The en route and descent part of the flight were uneventful. While the aircraft was descending through 1245 ft Radio Altimeter (RA), the landing gear was selected down. The landing gear indication was: nose landing gear (NLG) down and locked, left main landing gear (MLG) down and locked and right MLG in transit. A go around was initiated. A few seconds later, the landing gear was selected up and the landing gear was up. The landing gear up indication was normal. Kastrup Tower was informed about the landing gear problem and that the aircraft was making a go around. The flight crew was instructed to contact Copenhagen Approach. In order to solve the landing gear problem, the flight crew requested radar vectors around the area. The landing gear was selected down and the again the right main landing gear remained 'in transit'. After contacting the operator's technical department it was decided to use the alternate landing gear extension procedure. Without success, the commander manually tried to pump the landing gear down. The commander made a passenger briefing explaining that the landing would be an emergency landing and that the landing was expected in about half an hour. During the approach the crew manually tried to pump the landing gear down, and again with success. The flight crew decided to shut down the right engine. While the aircraft was passing through approximately 800 feet RA, the commander instructed the passengers to brace for impact. Abeam taxiway B3, the aircraft left MLG touched down on runway 04R. After touch-down, the left engine was selected to reverse and the power was increased. The aircraft followed the runway centreline approximately 20 seconds. The aircraft right propeller, aft fuselage and right wingtip then made contact with the runway surface. The aircraft started to turn to the right and as it departed the runway it damaged two runway edge lights. An examination identified a blocked orifice within the actuator assembly which prevented the complete extension of the right main landing gear. 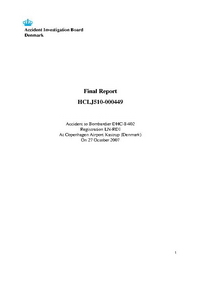 This finding is not related to the two previous accidents which occurred in September 2007, according to the Danish Accident Investigation Board. The retraction/extension actuator restrictor valve was blocked with an O-Ring. The O-Ring was part of the solenoid sequence valve (SSV) which had been replaced on October 16. The O-Ring of the replaced part could have migrated into the landing gear hydraulic system. A mechanical sequence valve (MSV) blocked its way and the O-Ring was able to travel further to its final location in the right main landing gear retraction/extension actuator restrictor valve when this MSV was replaced on 22 October 2007. The entire SAS fleet of DHC-8-400 planes had been grounded earlier following two similar accidents on September 9 and 12. Following an extensive inspection program and parts replacement, SAS began returning planes to service as of October 4, 2007. All aircraft were back in service on October 14. On the accident flight on 27th October 2007 during extension of the Landing Gear, the right MLG extension fluid flow had enough flow to force a part of the damaged O-ring through the small orifice hole in the floating valve in the Retract Port Restrictor which blocked off the hydraulic fluid flow. The MLG Retraction/Extension Actuator was hydraulically locked by the blocked Retract Port Restrictor, which caused the right MLG to be stuck in the almost up position. In this situation, it was not possible to extend the right MLG. On the day of the accident, October 27, 2007, SAS grounded all Dash 8-400 aircraft within the SAS Group until further notice. On October 28, SAS decided to immediately discontinue the use of this type of aircraft. It is recommended to review if an in-line filter to protect the extend port of the Main Landing Gear Retraction/Extension Actuator is necessary. It is also recommended to review the design of the single line Main Landing Gear hydraulic system in order to prevent hydraulic locking of the Main Landing Gear system. The review should include a possible in-line filter blockage. It is recommended to review the information that was available to the maintenance personnel in its unified whole to avoid misunderstandings of the definitions of aircraft components and/or aircraft parts as described. The information sources were the aircraft manufacturer serialization list, operator computerized data support system, the IPC, the documentation following the MSV and the identification plate fitted to the MSV. Distance from Bergen-Flesland Airport to København-Kastrup Airport as the crow flies is 674 km (421 miles).